Deliver happiness into the lives of the special people in your life by sending this Attractive Winnie The Pooh Stationery Set for School Going Kids and create a magical world full of love for them. 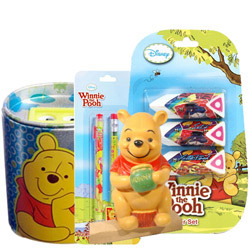 This Stationery Set include Pencil Set, Coin Bank, Eraser Set and Sharpener, all designed with cute Winnie The Pooh Pattern. Key Features of this Set include bright Refreshing color, made of Best Quality Fiber and Easy to Carry.